The commitment of Calzaturificio Giovanni Fabiani towards perfection is reflected also in the attention shown towards all aspects of business management which enabled it to achieve significant environmental and quality certifications. Supply chain traceability, which ensures that all phases of the product Fabiani are made in Italy. With ISO 14001 certification the Calzaturificio Giovanni Fabiani srl has adopted a management system for controlling the environmental impacts of its activities, searching for systematically improving consistently, effective and above all sustainable. This strategy was put into practice by adopting water adhesives in 80% of its assets, in the use of natural gas vehicles and adoption of an environmental policy that has set itself the objective of reducing energy consumption through the use of led lighting and production work in the use of environmentally friendly materials. Carbon Footprint Certification expresses atmospheric emissions in terms of CO2. The Calzaturificio Giovanni Fabiani srl is one of the first in the world in bearing it and then measured its environmental impact on the greenhouse effect. The choice the product to be evaluated has fallen upon a very particular shoe, the ecological footwear. This study has shown that the consumption of these shoes is 70 kg of Co2 per pair. The business objective is to search for new materials to reduce emissions further. The ICEA specifications for ecological footwear is very important and only through a search lasting more than a year on natural materials, it has come to get it. 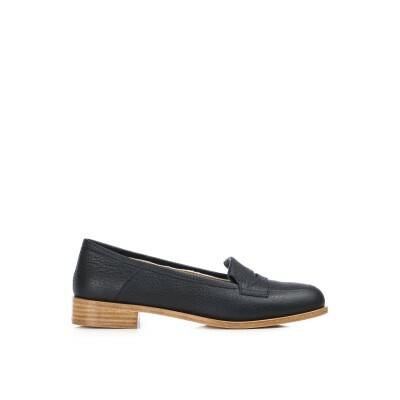 Calzaturificio Giovanni Fabiani is the FIRST IN THE WORLD to boast the ecological footwear certification ICEA. THE ARTICLES CERTIFIED ICEA ARE FIONA AND OPRA. 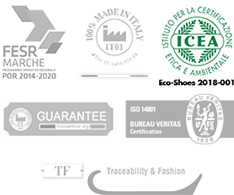 This certification allows us to declare that ours is not only Made in Italy, but 100% Made in Italy, that is all the processing phases and materials are made and manufactured in Italy. We know that the ' Made in ' label does not guarantee that the product derives exclusively from processes and Italian raw materials, so get this certification allows us to demonstrate the perfection of quality of our shoes.